Requires few adjustments after setup. Fence system could stand some improvement. So large that the idea of portability is partly defeated. Throat plate is unnecessarily thin. Where is the saw manufactured and assembled? What are the basic specs of the saw? Arbor 5/8″, Max. Cutting Capacity (at 90°) 3-5/8″, Max. Cutting Capacity (at 45°) 2-1/2″, No Load Speed 4,800 RPM, AMPS 15, Table Size 24-5/8″ x 22-1/4″, Net Weight 65.5 lbs., Shipping Weight 82 lbs. Is there a blade brake? Yes, the blade will stop instantly when the stop switch is hit. I tend to assess tools based on how much quality I get for the purchase price. For what this saw costs, it does indeed get the job done but falls a bit short when compared to competitors’ versions that are very similar and cost less. No doubt, Makita has built a reputation on high-quality, but not every product stands out as do some of their other offerings. For the price, I’d expect a much better stand and perhaps more portability. While it does produce a nice cut and has good, solid power, it’s heavy and very difficult to load and unload by yourself. Finally, the dust chute has fins that tend to get clogged quickly and easily. All in all, there are so many “little things” that are negative about this saw, its big positives are outweighed, in my opinion. One of the best things about this saw is that the table top is precision-machined, and thus has no problem staying true and delivering nice, high-quality cuts from the first day of use. For a whopping 4,800 RPM, the 15 amp motor is plenty strong, and features an electric brake for upping your capacity. Can be used equally well on the job site or in a small shop because of its power and adaptability. Works best for those who are cabinet installers, finish carpenters, floor/deck contractors, general contractors, remodelers, furniture makers, and skilled hobbyists who want a top-grade table saw that can be adapted to virtually any kind or size of job. This is a versatile saw that boasts dual slide guards that are adjustable and allow for simple measuring from the rip fence to the blade. The spreader/riving knife is able to handle dado, through, and non-through cuts because of its ability to be adjusted for three separate positions. For super-accurate cuts, the table top has been manufactured in a precision machined manner. For more cutting capacity, the right extension table can rip plywood sheets up to 4 x 8. The saw comes standard with stand, miter gauge, wrenches, rip fence, and a blade tipped with carbide. Like most Makita saws, this version is easy to maintain, store and clean. It comes with so many adjustable and easily-removable parts that routine cleanup is never a problem. Long-term maintenance and storage are also simple and built in to the design of the saw. Comes with a miter gauge, a rip fence, a push stick, spanner wrench, standard wrench, portable saw stand, a hex wrench, and a 10-inch 32T carbide-tipped blade. 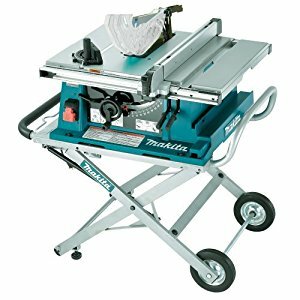 This Makita table saw can be used by a very wide range of professionals, as well as amateur wood-workers and some (skilled) hobbyists. For professional construction jobs, the device is ideal as a saw that can be moved from place to place on a large or small job site. As a shop saw, it works well in-place or as a use-and-store tool for semi-frequent jobs. Cabinet makers, furniture makers and professional carpenters can get full-time use from the Makita 2705 because its overall quality is what all carpenters and woodworkers have come to expect from the company. For cabinet installers and finish carpenters, the portable stand and traveling ability of the saw make for simple transportation and adaptability to just about any type of task or job site. Floor and deck contractors and remodelers enjoy the precision cuts that can make all the difference in large-scale chores that call for exactness. Several other products are available that offer all these features for a lower price. The stand was awkward and the overall weight of the saw make it much less “portable” than is claims to be. With dust chute fins that clog, the convenience factor takes a big hit. The stand is of low quality and bulky, making it not as easy to store as most saw stands, especially those in this price category. While the overall quality of the power capacity and cutting precision are up to the typical Makita standard, the rest of the main features are average at best. When even a non-professional carpenter sets out to purchase a table saw like this, he/she expects an all-around portable, lightweight, quality product. This saw does not live up to those expectations. 1. Makita 2705×1 vs Bosch 4100-09: When it comes to cutting depth, the Makita has a bit of an edge over the Bosch. Makita’s saw has a 3 and 5/8 inch compared to Bosch’s 3 and 1/8 inch at a ninety-degree angle. Even though for most users, that difference in depth is no big deal, it is a difference to be noted for those who are sticklers. For cutting performance, there is virtually no difference between the two saws. The same can be said for each saw’s ability to easily slice through hardwood, ply and composites. Each also features a carbide-tipped blade that can be upgraded. The Makita saw lists for a slightly lower price than the Bosch, but depending on sale prices and specials, the price issue can go either way. 2. Makita 2705×1 vs Dewalt 7491rs: As noted above, there is a slight difference in cutting depth, as the Dewalt has just a bit less than the Makita, but this is not a significant point of comparison for most consumers. The Dewalt stand is much easier to set up for quick jobs and is truly portable and sturdy. Dewalt also has an advantage with its rack and pinion fence system that offers a fast way to make adjustments. However, the Dewalt falls down in comparison with Makita’s saw because of its sometimes non-parallel miter slots and the fact that it does not come with any kind of blade storage. Price difference is minuscule as the Dewalt tends to list at most sellers for just a few dollars more than the Makita. 3. Makita 2705×1 vs Ridgid r4516: The most apparent two differences between the saws in this case are price and weight. The Ridgid typically costs about half what the Makita saw does, and the weight of the Ridgid is just 63 pounds compared to Makita’s 82 pounds. But the Makita does, because it is a higher-end product, come with many more features, as can be expected. But the Ridgid is rated very highly by customers on several different rating and sales websites, so it definitely delivers a good value for the price. What do users say about this table saw? Overall, users who purchase this saw tend to fall into two distinct groups: those who are quite happy with the product but who feel that it costs too much for the features and quality of the product. The second group are those who think this is one of Makita’s lesser offerings, compared with the company’s generally high-ranked saws. Major review sites routinely show this saw with a decent amount of five and four-star reviews, but also with quite a few one-, two-, and three-star reviews. As a carpenter and former cabinet installer, my overall view of this saw is that there are just too many other options out there for the same or less cost. It is a Makita which means it gets the job done, but it has several drawbacks and falls down in comparison with similar products in its price category from other manufacturers.